As with many renowned vegan eateries, NYC’s Candle Café is a restaurant I’ve coveted from afar, salivating over the many mouth-watering dishes photographed, enjoyed, and shared by vegan friends and acquaintances on Instagram, tumblr, and other social media outlets. (I have five dogs who I love to pieces – but they kind of put a damper on my travel plans.) Luckily, the burgeoning vegan cookbook market – and the increasing number of cookbooks released by popular vegan restaurants, such as Candle Café, The Chicago Vegan Diner, and Jivamuktea Café – has made it possible to enjoy even the most upscale menus from the comfort of your own kitchen. Hasta la vista, age of vicarious living! Candle Café ups the ante with Vegan Holiday Cooking, a special cookbook chock full of holiday-themed menus. While this isn’t the first vegan holiday cookbook on the market (there’s also Vegan Holiday Kitchen by Nava Atlas and Susan Voisin, as well as Zel Allen’s Vegan for the Holidays), Vegan Holiday Cooking is unique in its focus: rather than concentrating solely on the “big” holiday season – Thanksgiving through New Year’s – Pierson, Ramos, and Pineda extend their celebration across the calendar. The book includes ten menus for a variety of occasions, including the Super Bowl; the Lunar New Year; Valentine’s Day; Passover; Easter; Cinco de Mayo; the Fourth of July; Thanksgiving; Christmas; and New Year’s Eve. Each menu receives roughly the same amount of attention – the 4th of July and Christmas both merit 18 pages of coverage! 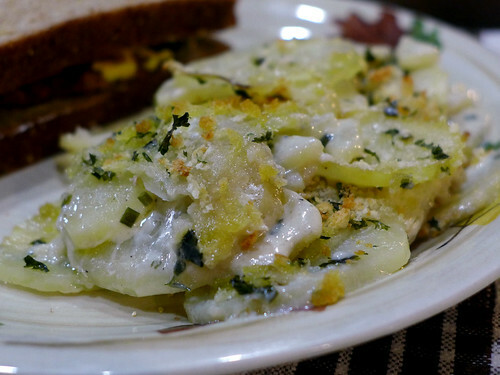 – resulting in a holiday cookbook with great depth and variety. For example, while the Thanksgiving menu features a number of traditional, hearty fall comfort foods (Roasted Squash Soup, Wild Rice and Cornbread Stuffing, Pecan Pie with Cinnamon Ice Cream), we also get a taste of Mexican foods via the Cinco de Mayo menu (Spanish Rice and Black Beans, Tempeh Fajitas, Crispy Black Bean Tacos), as well as Asian dishes courtesy of the Lunar New Year (Scallion Pancakes with Homemade Kimchi and Wasabi Aioli, Steamed Vegetable Dumplings with Ginger-Soy Dipping Sauce, Miso-Ginger Braised Tofu over Bamboo Rice Pilaf). 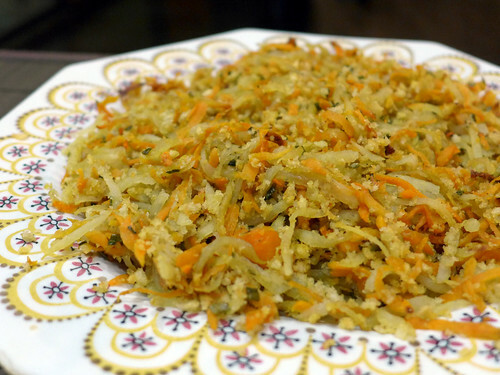 And we can’t forget the Passover Seder, which features a variety of veganized Jewish dishes. I can’t lie; I’m a little disappointed that my own favorite holiday (Halloween!) didn’t make the cut…especially when a technically-not-a-holiday (the Super Bowl! say what now?) did. Otherwise I found myself pleasantly surprised by the diversity of dishes and celebrations included here. Most of the required ingredients are common and easy to find in the US – though the Jewish and Asian menus may require a trip to a specialty store. Likewise, items like Ener-G Egg Replacer, silken tofu, and agave nectar might be hard to find except in a natural/health foods store – or online. I tried almost a dozen dishes in preparation for this review, with varying levels of success. 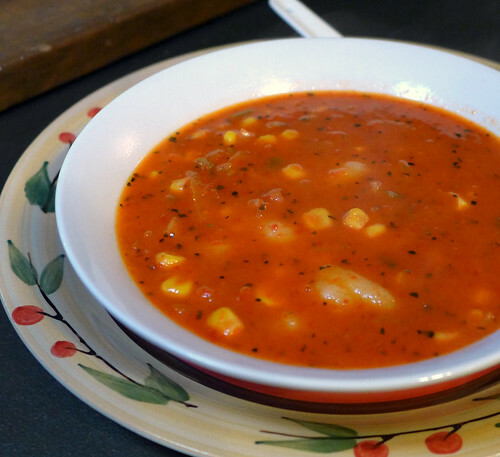 First, let’s start with the soups, which are always my favorite this time of year! 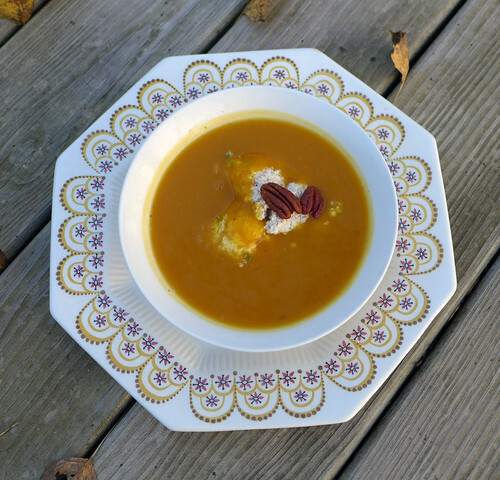 The Roasted Butternut Squash Soup with Almond Cream and Spiced Pumpkin Seeds proved an excellent use of my homegrown butternut squash (some of the last of the season, mind you). 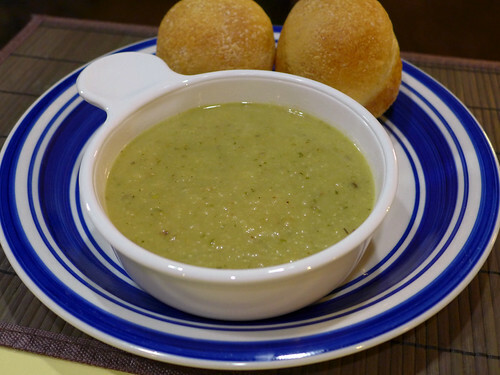 The soup is as delicious and savory as it is easy to make – but I wish I could say the same of the Almond Cream! Mine didn’t come out nearly as light and fluffy as that in the book; it was more of a paste than a cream. Even so, it tasted great; I ended up mixing the extras right in with the soup rather than plopping it on top. I didn’t have any pumpkin seeds on hand, but pecans subbed in nicely. and Roasted Red Pepper Soup with Tofu Dumplings Potato Gnocchi, which just might be my favorite soup of the bunch. Roasted red peppers are the best and, if you’re in a hurry, you can simplify this dish by swapping out the homemade dumplings for store-bought gnocchi instead! 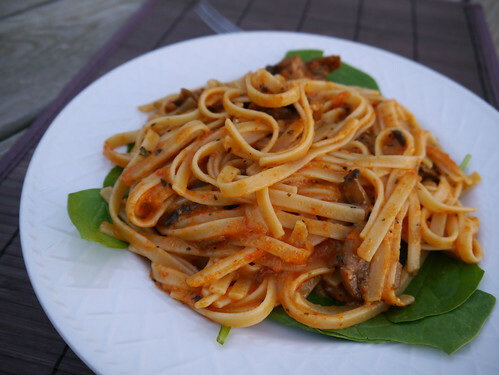 Speaking of roasted red peppers, the Homemade Pappardelle with Spinach, Portabello Mushrooms, and Roasted Red Pepper Sauce is to die for. 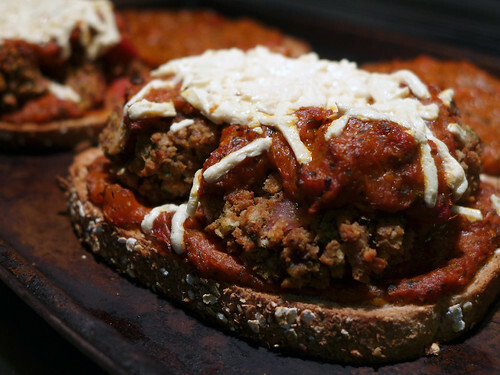 A nice change from traditional marinara sauce, roasted red pepper sauce somehow manages to be both sweet and smoky at the same time. One of my New Year’s resolutions is to swap out the tomatoes for red peppers more often! Again, you can hack this dish by using store-bought pasta in place of Homemade Pappardelle (which is what I did here). Easy peasy! 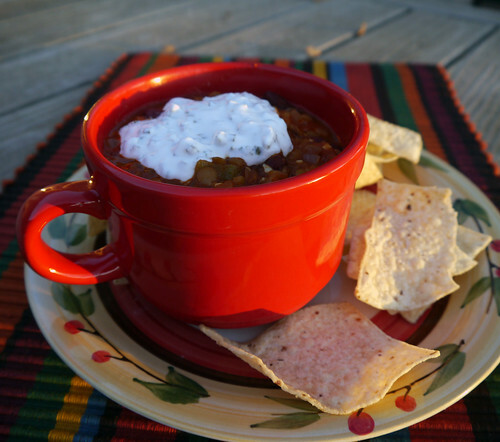 I especially love that the recipe uses a mix of lentils and beans, which is a little easier on my tummy than an all-bean chili mix. 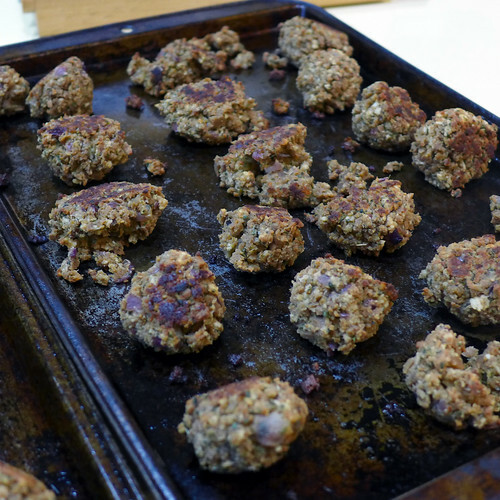 Sadly, another Super Bowl dish didn’t fare quite as well: the dough for the titular wheat balls in the Wheat Ball Heroes just didn’t want to hold together. I tried tinkering with the mix, adding a splash of water here and a little extra oil there. It helped a bit, but just barely. Crumbly balls, blurg! 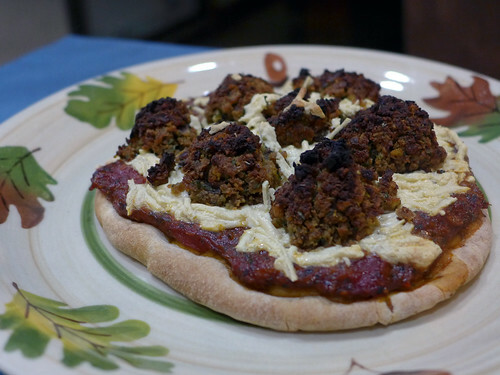 and the leftover balls made an excellent topping for my on-the-fly pita pizzas! 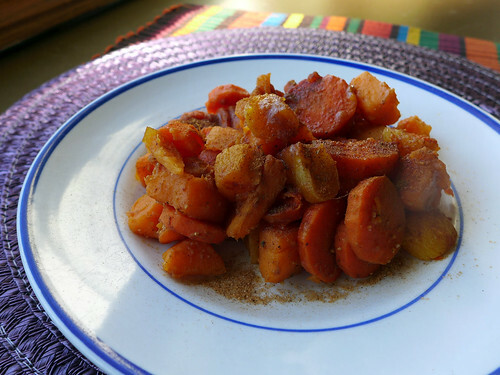 The Sweet Potato Latkes – a 50/50 blend of Russet and sweet potatoes – were afflicted with a similar problem. This time around, no amount of adjustments could coax the dough into clinging together, so instead of latkes, I made baked sweet potato hash browns. Tasty, but not latkes! 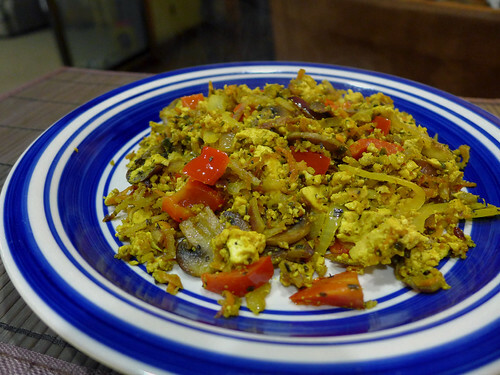 I repurposed the leftovers for a tofu scramble which, next to pizza toppings, is my favorite way to dispense with extra foodstuffs. 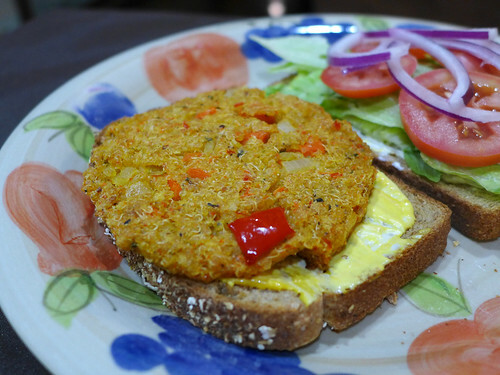 The Quinoa Vegetable Cakes are supposed to be enjoyed as a sort of cake-on-the-side, but naturally I stuffed them between two slices of whole wheat bread, slopped some Vegenaise on there, and called ’em veggie burgers. So, so good! These required more time in the oven, and at a higher temp than recommended: instead of ten minutes at 350F, ten minutes on each side at 400F. 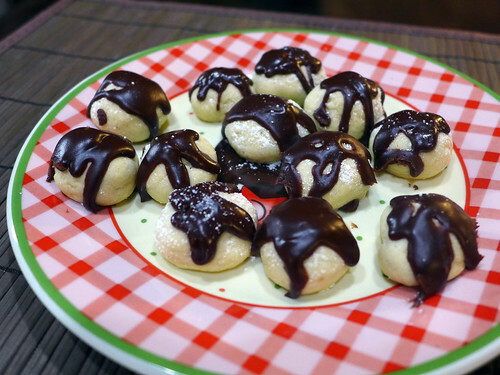 And for dessert: Snowball Cookies! The cookies are aces, though the chocolate sauce did prove a little problematic: not only does the recipe make at least three times as much sauce as is needed for drizzling, but it’s quite thin and never really sets – not even in the fridge. I ended up adding a ton (okay, a quarter cup) of cornstarch to thicken it up. The cookies were a little easier to handle this way, but still somewhat sticky. While I found a few new favorites in Vegan Holiday Cooking (e.g., the Roasted Red Pepper Sauce; the Roasted Red Pepper Soup; the Quinoa Vegetable Cakes), I was surprised by how many of the recipes required adjustments (the chocolate sauce in the Snowball Cookies; the bake time on the Quinoa Vegetable Cakes) or just straight-up failed altogether (the Sweet Potato Latkes; the Wheat Balls, kinda sorta). Although I enjoyed the cookbook as a whole, I’m docking it one point for the misses and near-misses I encountered. This entry was posted on Thursday, December 11th, 2014 at 2:42 pm. You can follow any responses to this entry through the RSS 2.0 feed. You can leave a response, or trackback from your own site.